>Whether you’re working to improve or maintain your credit score or are looking for ways to maintain it, you might be making some easy-to-miss mistakes. The good news is that by knowing simple information about your credit score, you can avoid negatively affecting your credit. Even though most credit scoring models — such as the ones used by the three major credit bureaus, Experian®, Equifax®, and TransUnion® — can seem complicated, they ultimately break down into some finance basics. To help you increase your borrowing power and to become more financially literate, here are the top four things you should know about maintaining your credit score (as well as an infographic to help illustrate). Make sure you pay your bills on time. While it might seem simple enough, the importance of paying your bills before or when they’re due is critical to having a good credit score. 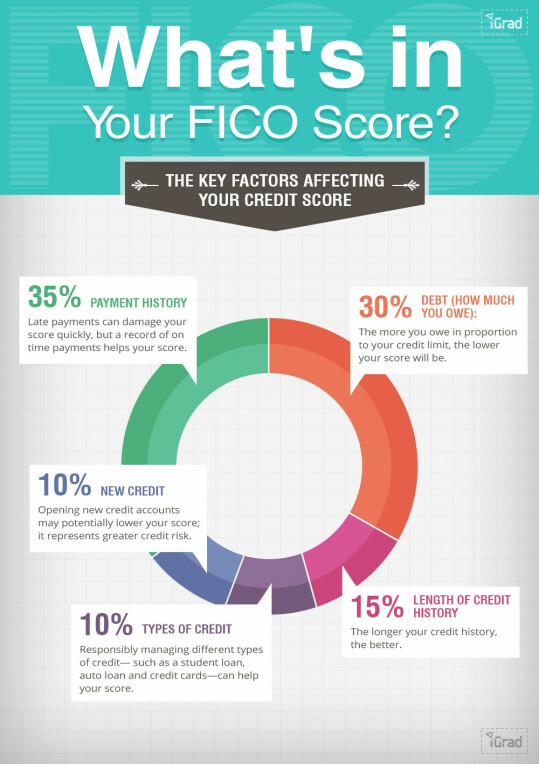 For most credit scoring models, like the FICO® Score shown in the infographic below, your payment history makes up the largest portion of what creditors and lenders use to see if you’re a credit risk. Having late payments, or worse, having an account sent off to a collection agency or declaring bankruptcy can negatively affect your credit, lowering your scores. Try not to apply for too many new accounts at once. Sometimes applying for new rewards cards, opening retail store cards to obtain promotional discounts, or shopping around for a loan can impact your credit by creating what’s known as inquiries on your report. When a credit card company or a lender requests to see a copy of your credit report, this is called an inquiry (or a “hard” inquiry). Depending on the creditor or lender that’s checking on your report, too many hard inquiries can negatively impact your credit score. Don’t carry a balance on your credit cards. Having a balance, even a small one, isn’t a sign to the credit bureaus that you are good at managing your credit. Carrying a balance can lead to higher interest rates and fees. Try to pay the balance off in full, if possible. If you’re only able to make the minimum payments, continue to do so until the debt is paid off. Don’t close out paid off credit cards. Once you have paid your credit card debt, don’t close out the account. Even if you’re no longer using the credit card, having it open means that you have a longer credit history, especially if it’s a card you’ve had for a while. To avoid the temptation of using the card, store it in a secure, safe location. These are only a few steps to help you maintain your credit score and to hopefully improve it. The following infographic from iGrad shows how credit scores are calculated and what might hurt your ability to get credit later. If you need more information about understanding your credit score, read more here.